Outline: The story of Nicodemus. Illustrates the thought that some people follow religious customs but don't recognize the spiritual basis and the necessasry new birth. Being born spiritually makes it possible to escape the consequences of sin. A new nature is needed in order to live a new life, and the ony way to get it is through being born spiritually into God's family. One day, Jesus was teaching people about the family of God, and there was a man named Nicodemus who heard Jesus. He was a great man among his people, and very religious. He thought he was already in the family of God. He wanted to learn more about it. After it was dark he went to see Jesus. He said, "Lord, we know that God has sent you to teach us." But Jesus knew that Nicodemus had never entered God's family. Jesus can see into every person's heart. He answered, "Unless you are born a second time, you cannot enter God's family." Nicodemus was puzzled. "How can a man be born more than once?" he asked. Jesus answered, "Don't be surprised. Whatever is born from the body is only body, but whatever is born by the Spirit is spirit. You have to be born again by the Spirit of God, Nicodemus." 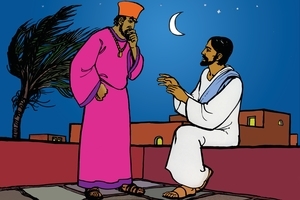 Today many people are like Nicodemus. They do good deeds. They carefully follow religious customs (Christian customs). They forget that God's family is spiritual. There is only one way to enter the family of your parents. That is by being born. There is only one way to enter the family of God. That is by being born again. If we do not enter God's family, we abide in spiritual darkness, and when we die we go to the place where sin is punished. God is very holy. He hates sin. When a person is born again, God gives him a new life and he too begins to hate sin. Sinful habits are broken. There is a proverb in God's book, which says, "The pig that was washed, returns to the mud." Why does it go back to the mud? Because a pig likes the mud. That is its way of living. When we receive God's Spirit, our old desires are changed and we begin to hate sin. How can a man receive God's Spirit? Jesus says, "I am standing at the door knocking. If you open the door, I will come in. Jesus wants to come into your life. Jesus and God's Spirit are the same. God said, "Whoever receives Jesus, also receives the right to become My child." This is how you come into God's family. This brings to you everlasting life. Without this new birth, you will not have new life. Do not refuse the Saviour who wants to enter. Receive Him today.